Don't fall in love with a Flash Website if you want to sell. There are some beautiful looking flash websites out there - but most of them have several things in common, they're slow to load, they're bad for your SEO (Search Engine Optimisatin) and they won't help you sell, so when you're talking to an award coveting web designer who's trying to push you in the flash direction just run away - you really don't want him and the fact that he's trying to edge you towards flash means either cares far more about himself than about you, or he doesn't know what he's talking about. Lose him, either way. On my travels reviewing retail websites, whether gorgeous or otherwise, I've been stupified by the amount of flash that's out there - serious sales debilitating flash. Far too many of the clients I've worked with have really had no idea why their sites aren't working for them, and although it isn't easy to say to a client 'sorry, guys, but you need a re-design', that's had to be my main message. Search Indexing - Although the major search engines are endeavouring to be able to index flash better, the very word 'endeavouring' should put you off. In the main they can't read flash which makes Search Engine Optimisation seriously difficult. Keyword Linking - Emphasising what I've just said - Google and others cannot read your keyword rich text, no matter how good it is, and you can't use it for links to other popular products or essential areas of your website. Deep Linking and your title tags - All the pages of a flash website will have the same URL, making it impossible for your visitors to bookmark a favourite page. A mix of flash and html may work, but is frequently very messy, making for usability issues and confusing your visitors. Don't Slow Me Down - In this age of ever faster web searching and immediate online gratification we're becoming less and less likely to wait - for anything. To expect your visitors or customers to wait for your flash site to load is self-destructive because, quite simply, they won't. Design me silly - Flash is mainly about design and not what you're really looking to offer - a great user experience. It affects best practice navigation and your visitors' ability to get straight to what they're looking for. Great usability is what you need to be looking for when you have a website, flash makes this extremely difficult. Let me Introduce You - Back in the dark ages of web design a lot of sites had what they call 'Splash Pages' - an intro sitting in front of the Home Page. Just about all of the great sites have binned these now because - yes you guessed it - I wouldn't want to wait for them to load and neither will your visitors. If you have a Splash Page, no matter how great you think it is for your brand, it won't be working for your potential or existing customers so please please get rid of it. It'll Cost Ya - On my website at http://www.thesiteguide.com/ I can change pretty well everything, from the pictures and banners to the categories, content and links. I'm in control. Set up a flash site and you'll have lost the chance to that control, not only that but your designer will be rubbing his hands with glee, because every time you want something changed you'll have to pay for it (and probably wait for it as well). Track me Down - One of the most important things you do on your website is analyse what people are doing (I hope) - which pages they're going to, how long they're staying there and, even more importantly, which pages they're not visiting. With flash you lose your analytical ability because, of course, you've lost your separate page URL's. This makes it impossible for you to really know what's going on. Don't Call Me - More and more smart phone owners are going online although downloads are still relatively slow compared to a pc. They will not be waiting for your flash site to load while dashing from one meeting to another. If you want to go mobile, don't go flash. Take me Back - No sorry, can't. On a flash website the all popular Back button doesn't work properly, so if your visitor wants to revisit a previous page because he's got somewhere by mistake - he can't. Annoying or what? 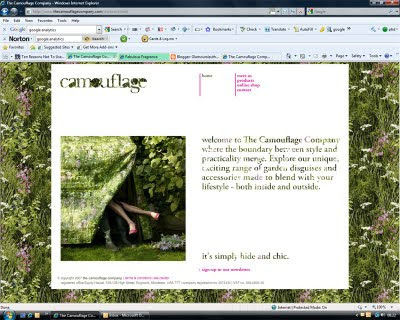 The website I've used as an example is The Camouflage Company - who offer a clever, witty and ever expanding range of gorgeous home essentials such as shopping bags and storage solutions. They're well worth checking out. You'll go straight to the shopping site, not the flash site!!! Also take a look at the all new http://www.thesiteguide.com/ which has launched this week. If you'd like any help with your website, flash or otherwise, just send me an email.